Seemingly functional, but looks can be deceiving: The china cabinet’s glass shelves were overly bendy, groaning from the weight of four modest place settings, and their jagged edges resulted in chipped china and hand lacerations. The table had the usual surface damage from years of use, and two of the legs had started to split. It was still useable, but we knew it needed replacing. The chairs had some stains, the upholstery was coming apart at the seams, and two of them had been wallowed out by sleeping animals in multiple households. The light fixture from my parents was a replacement for the sad, single glass upside down bowl-like light that came with the house. The bowl had been splattered with white paint from when the former owners/tenants/property managers’ workers must have neglected to cover or take down the light fixture when they spray painted the whole house renter white. The light from my parents worked, but our CFL bulbs stuck out of it weirdly (look carefully in the picture above and you’ll see them!). Plus, it hurt like crazy when you bumped your head on it, as we did regularly when getting up from the table, thanks to the typical builder placement of the light in the center of the room (not accounting for table length and china cabinet/buffet/sideboard placement in a house with only 1 eating area). We donated the table and chairs to a local charity, moved the rug to the front bedroom, and plan to sell the china cabinet on Craigslist or at our upcoming neighborhood spring garage sale. This really opened up the space horizontally and vertically. We also rented scaffolding to be able to paint the two tall walls (Shake, Splatter, and Roll), replaced the light fixture, and got a new CUSTOM dining set from a local business. The turquoise paint on the south wall is Sherwin Williams Drizzle, the pale blue-gray paint on the west wall is Sherwin Williams Comfort Gray, and the chandy is the Hampton Bay Menlo Park 5-light Chandelier from Home Depot. I had originally planned to DIY a Mason Jar light fixture, but we decided that we didn’t want to go over-the-top with the farmhouse style. 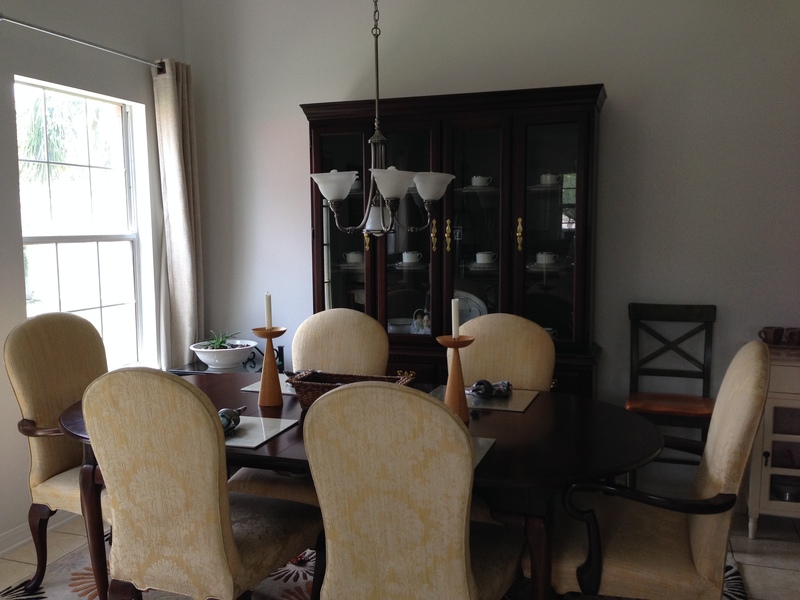 The Hampton Bay Menlo Park fixture came with the two-story length of chain/wire we needed and had clean lines. The first one we got was a lemon (faulty wiring in one of the arms it seemed), but we took a risk and ordered a replacement with which we’ve been satisfied. It’s not amazing by most lighting standards, but this is the best we could find in the < $200 price range at different retailers. We just can’t justify spending $$$ for a light we don’t use that often, given that we mostly eat dinner by candlelight and get enough sun from the southern exposure to not need it during the day, even on cloudy days. We will eventually replace the shades because the yellowish-beige is the only thing we don’t like about it, but chandy shades (especially the ones we want from Shades of Light) aren’t cheap. 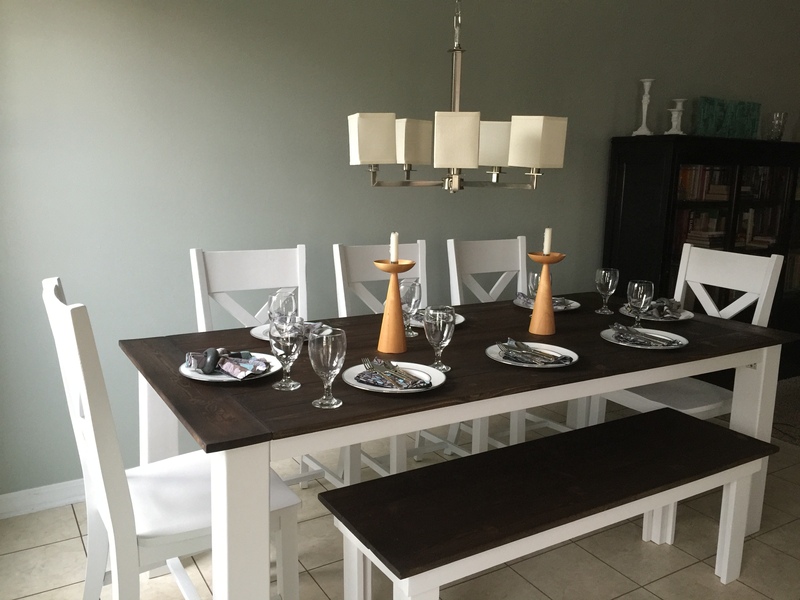 We ordered the farmhouse table, bench, and chairs from a local business, Tide Life Southern Coastal Living, run by a husband and wife team. Their work was recently featured on HGTV and the DiY network! They can make any wood furniture you want in any size and style you like, although they specialize in farmhouse styles similar to what Pottery Barn, West Elm, and Restoration Hardware offer (but for MUCH MUCH less!). We were also able to get a 7 foot table and bench to match, which is not a standard size offered by most retailers. The 7 foot table allows us to seat 8 people comfortably without making our smallish dining space feel cramped. In Goldilocks parlance, the 6 foot would have been too small, the 8 foot too large, but the 7 foot is juuuuust right. They offer all kinds of paint, stain, wash, and distress options. 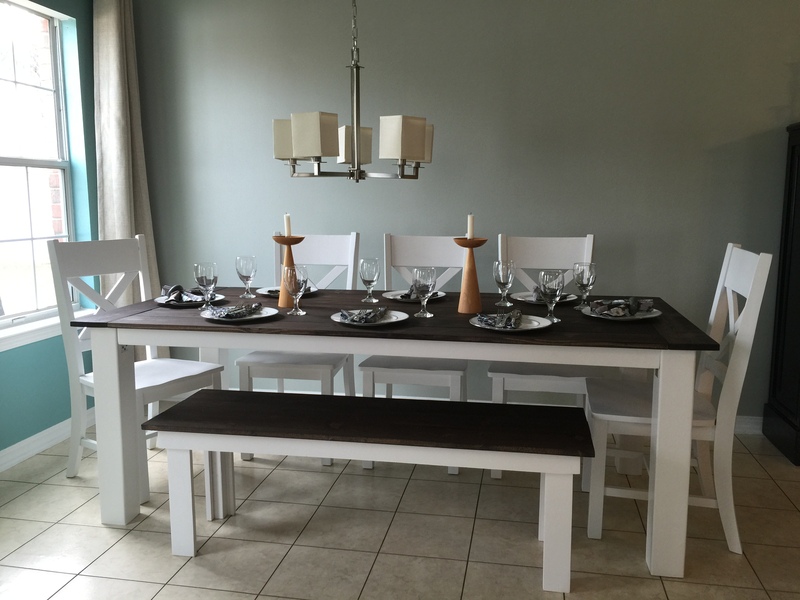 We chose to do an espresso stained top for the table and bench, with white legs and chairs painted Bistro White in semi-gloss by Valspar. They have used Annie Sloan Chalk Paint in the past but typically use Valspar so that their customers can easily find paint for touch-ups as needed. There is only one ASCP retailer in our area, and it isn’t conveniently located for most of Tide Life’s customers. They do local deliveries but have recently traveled to other states in the Southeastern US to deliver, as their business has greatly expanded in the last few months. 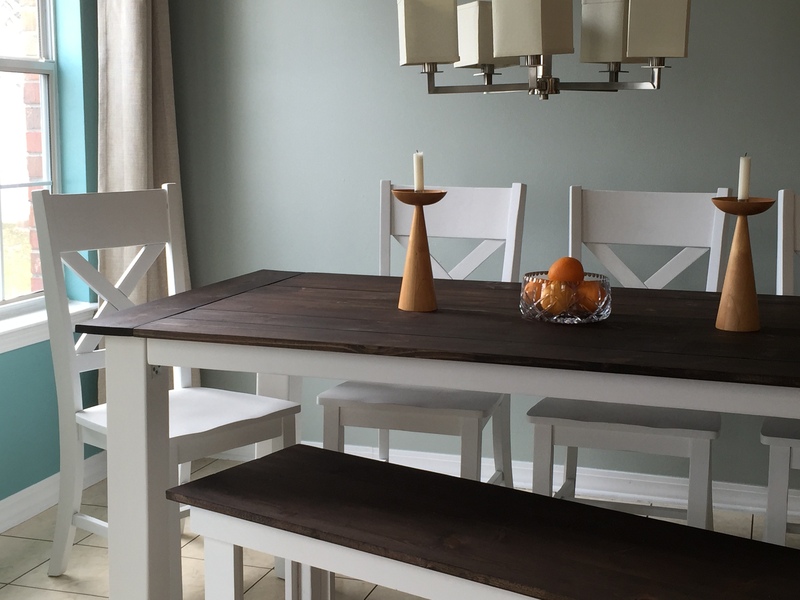 Isn’t it amazing how a different table totally changes the look of this space? We love how the dark table top makes our china (Kate Spade Library Lane Aqua) pop, and the blue ridge of our china ties in nicely with our wall colors. The napkins are from this post. Now our dining area is a better reflection of our style and is more compatible with our beach lifestyle. Next up is centering the chandelier, replacing the flooring with wood look tile, and adding some art. And doesn’t a bowl of oranges just make it look that much more amazing? Now that’s more like it. While we were on the KaZoo blog hiatus, we didn’t totally stop doing things around the house. In fact, the big project we talked about here, we actually did tackle over the winter–Valentine’s Day/Presidents’ Day weekend, to be exact. We are obviously romantics (see message in paint below). We have 4 foot scaffolding that Chris’s mom got us when we bought our first home with Cathedral ceilings, but this time it was too short for the job. We rented scaffolding from Coastal Equipment Rental over the weekend (you get a better deal that way), and Chris painted while I worked on school stuff. Call me crazy, but I’d much rather be painting than writing a paper. Talk about torture–hearing the sounds of rollers against a wall and the creak of scaffolding when you’re in the next room staring at a blinking cursor. The creak of scaffolding made Chris a bit shaky, but it sounded positively delightful to me. Pure madness. Anyway, Chris spent Saturday morning prepping the walls for paint and that afternoon painting the west wall of the living/dining area Sherwin Williams Sea Salt, followed by the south kitchen/dining wall in Sherwin Williams Drizzle. While he took a break, I studied the paint and came to a disappointing conclusion. Sea Salt just did not look good on that huge wall. Sea Salt and Comfort Gray are both considered chameleon colors, which can be good but also tricky. Unfortunately, the way light hits that big ugly wall, Sea Salt looked good in small test patches but not on such a large scale, and especially bad compared to how awesome the Drizzle looked. 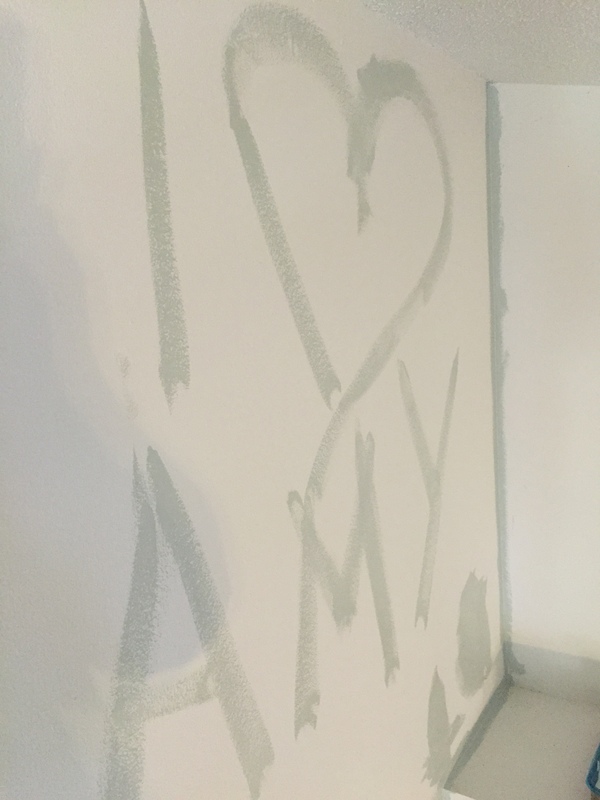 Although Chris wasn’t thrilled that he had spent an entire afternoon painting a wall that would have to be repainted, the paint handwriting was on the wall. While taking a dinner break from screen-staring, I quickly slapped some Sherwin Williams Light French Gray I had from years ago on this small, yellowy-beige table we use to store the cat food. I still need to scrape the paint off the glass panes, though. 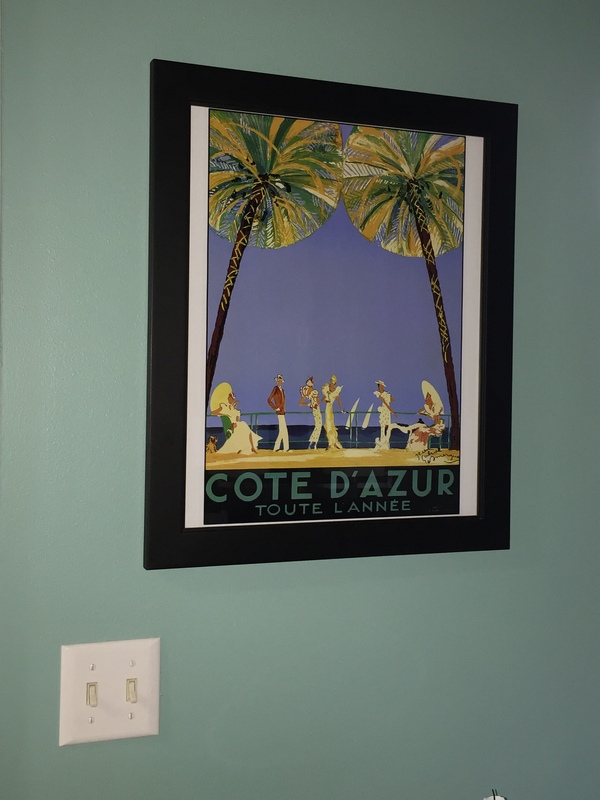 After the wall paint dried, I hung 4 Pottery Barn chalkboards in the kitchen that we bought five years ago with a coupon from our sofa purchase (making them half price) and my favorite vintage travel poster art print in the dining area. It is difficult to photograph this area because of the southern exposure and the dimness of the living room. Apologies. The font color of the poster is almost a perfect match to the Drizzle! Interestingly enough, Drizzle is also a color that changes dramatically with light. Note how blue-green it looks in some picture, compared to how green-blue it looks in others. As our mini-command center in the kitchen, the chalkboards have proven extremely useful, and we get lots of compliments on them. Now, those blah renter white walls are gone. It’s amazing how just a little paint (or in this case, a lot) can make such a dramatic difference. Yay paint! Because I’ve seen so many people Pinning Sea Salt and Comfort Gray as colors, here are my two cents on these colors and other members of their family we’ve tried (Oyster Bay, Retreat): Comfort Gray dries with more green-gray undertones, Sea Salt dries to a paler blue, which is pretty, but I’m not one for ‘pretty’ colors. I want colors that are clean, crisp, moody, or dramatic, and it is none of the above. I would describe its gray undertones as dishwater gray–perfect for the rustic, shabby chic, cottage look, but we prefer a more industrial farmhouse look. Our kitchen is currently Sea Salt, but you won’t see any of it when we do our big kitchen reno, and right now, its dinginess makes our truly dingy cabinets look crisper. We’re also using the rest of the Sea Salt we bought in hallways because it is light and airy, helping the tiny hallways out. In larger rooms, we like a little more color. Oyster Bay dries to a dusty blue-gray color (again, not what we wanted in our main area), and Retreat dries to a deep, moody, marine green. Interesting how they seem to alternate which undertone is more pronounced as you move down the swatch. We love Comfort Gray and Retreat best. Of course, the light in your home plays with all of these colors in different ways, and the light in our house is arguably the weirdest we’ve ever experienced…making for tricky business indeed. Live and learn, right? So those of you who have been reading our blog have probably wondered if we have been abducted by aliens or joined the ranks of all the people who had good intentions of starting a blog but ran out of ideas, energy, inspiration, and time. Then, mysteriously, with no explanation, a post appeared last week. A post of pictures and virtually no words. No explanation for our long absence or our return. Long story short? Bad. Things. Happen. October to March has been a rough season for us. I haven’t made sufficient progress on my dissertation to finish before my funding runs out. Major burnout there, peeps, but try as I might, I can barely bring myself to look at my computer screen anymore. Are there any jobs that don’t require the use of a computer? Sign me up. So there’s that. Then Poseidon’s health went rapidly downhill (test results all came back negative), resulting in his untimely demise on December 23. I asked for an autopsy after we had to let him go, and our vet found an inoperable, untreatable mass in his abdomen. He was so gentle and loving and devoted, and we didn’t have time to prepare to say goodbye. The sea here has never looked so ugly and cold as it did that day as we drove to and from the vet. Not a very merry Christmas for us. Even now, I can’t talk or write about it without tears streaming. Cleopatra, our other cat, has been in mourning, too. There were also a few bouts of serious sickness for each of us, resulting in multiple rounds of meds multiple times for multiple infections for the more immune-compromised one (Mrs. KaZoo). We went through two bargain club packs of Kleenex–some for sickness, others for mourning, and still others for depression. It’s been a very melancholy fall/winter. But spring has its way of reminding us that things can (and will) get brighter. We got a new kitten, Hermes, and he has brought us joy in an otherwise bleak time. We’ve also had some nice weather recently that has renewed our energy for life, DIY, and blogging. So here’s to KaZoo Anew.